Band introduction: Capable of bringing rooms to a standstill, moving from vastly atmospheric and minimalist to symphonic and confronting, Echotide’s kaleidoscopic immersive wall of sound is an instrumental exploration of post, psychedelic and progressive rock. – Taken from the band’s Bandcamp page. 1st Listen: The band’s first track “Of Addictions” builds over dainty piano work that lulls me into a false sense of security as it builds and builds, only to hit me with a barrage of metallic chords. It effortlessly transforms into an ambient soundscape that calms the mind after the previous heaviness and, before you know it, the next track is well on its way. The band lives up to their name as the tracks ebb and flow throughout their duration, like the tide, crescendos build and fade away; sometimes they come on hard, mostly they tease and disappear before I have noticed they have gone. 2nd Listen: Tracks that build from almost nothing to big crashing sounds are the reason I listen to music. “Of Addictions” does this brilliantly. Despite anticipating the metal influence breaking into the mix it comes in at the perfect point. The heavy riffing moves away to ambience and then hits you again only to find its way back to ambience and moves discreetly into the next track “Floodlights”. 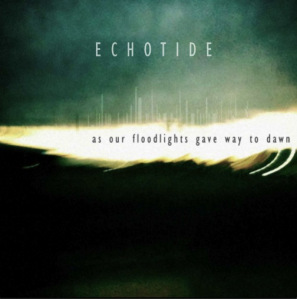 Unlike a lot of “post-rock” type bands, Echotide’s main instrument is the piano. It is used beautifully; “Floodlights” alone is testament to that. Again the track has a long drawn out intro until the drums slowly come in to what becomes a tom driven groove that leads, but does not wander off with the music. It’s Echotide’s style to move between quiet and loud parts and again the drums drop out and the track almost disappears until those drums sneak back into the mix and build back up to become the main instrument with carefully placed fills. You’d be fooled into thinking that the track finishes but the drums go and the music subsides into a quiet ebb. “3mwy (Of Hope)” opens with reversed instruments and then a glockenspiel comes into the mix while earnest guitar chords fight their way into the mix. Then the drums come in. I’m starting to see a pattern with the way Echotide write. The arrangements are very similar from track to track. Luckily the quality of the music makes up for this. A violin is welcomed into the mix in the middle of this track and then distorted guitars join in to finish off the track with typically post-rock tremolo picked melodic lines. The shortest track on the album is followed by the longest. “Embers Glow” is a 13 minute epic that is mesmerising. It slowly meanders with piano and violin and drums creeping up at the back of the mix. It’s not until 5:30 that it bursts into life. It’s welcomed as I have been on the edge of my seat, “is it coming, is it coming?” The drums march the song for a couple of minutes and then we get back to a solo piano that shimmers in delay and reduces in volume and introduces ambient waves of sound. The sound continues into “Mare Cognitum (Of Memory)” for a minute or so and a guitar takes centre stage for a post-rock out. A far eastern sound is the last part of the track. Music played with a storm raging far, far way. The rain gets louder and the storm comes in; “Stillwaters” plays underneath the downpour. This track keeps its pace for the most part. No crescendos as such, but it the drums suddenly come in and prepare you for a rush, but nothing happens. The music comes back in and then tabla, or similar, come in with heavy guitar chords. Utterly triumphant! I was slightly distracted during the final track, “Of Overcoming Addictions”. It sounded pretty chilled out throughout. I’m definitely looking forward to listening to this record again. 3rd Listen: I hate being interrupted when listening to music. This time it was a director from the company I work for. I should probably be doing some work, I guess. This album is too good to wait for so I have put it on while doing some menial task. So he walks over. I can feel him making a beeline without me even turning my head. The distorted guitar from “Of Addictions” blasts through my headphones. We discuss whatever it is he wants to discuss. Things he won’t understand as he does not do my job, but he needs to know to show that he’s taking charge of a situation. He goes; I have to restart the track. It’s that good. Arrrgh! They will never understand. Conclusion: A beautiful album that runs like an entire track. This is a must for anybody into this type of music. Melodic always, but with some crushing moments of heaviness. Definitely one to buy. I hope a physical run is planned. This entry was posted in Album Review and tagged Cinematic, Experimental, Instrumental, post-rock, rock. Bookmark the permalink.